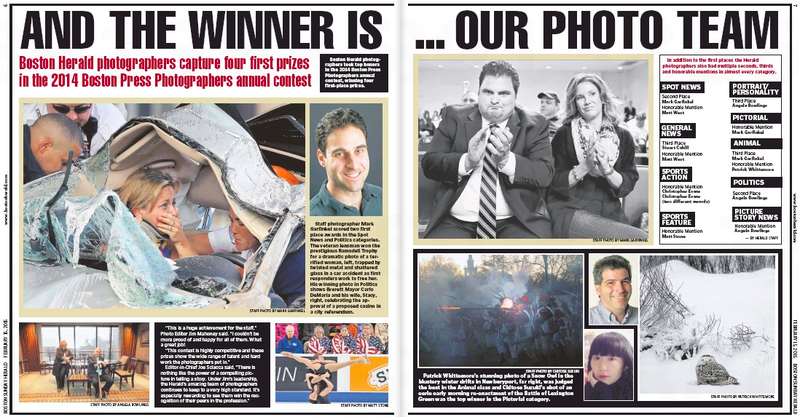 The Boston Press Photographers Association has given out its annual awards and the Boston Herald is pleased to tell you – in a two-page spread no less – that it took home four first prizes. Staff photographer Mark Garfinkel scored two first place awards in the Spot News and Politics categories. 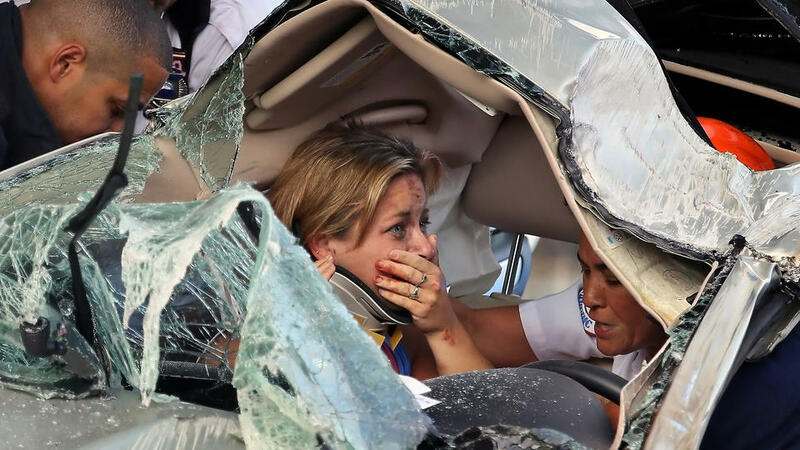 The veteran lensman won the prestigious Ramsdell Trophy for a dramatic photo of a terrified woman, left, trapped by twisted metal and shattered glass in a car accident as first responders work to free her. His winning photo in Politics shows Everett Mayor Carlo DeMaria and his wife, Stacy, right, celebrating the approval of a proposed casino in a city referendum. Patrick Whittemore’s stunning photo of a Snow Owl in the blustery winter drifts in Newburyport was judged the best in the Animal class and Chitose Suzuki’s shot of an eerie early morning re-enactment of the Battle of Lexington Green was the top winner in the Pictorial category. 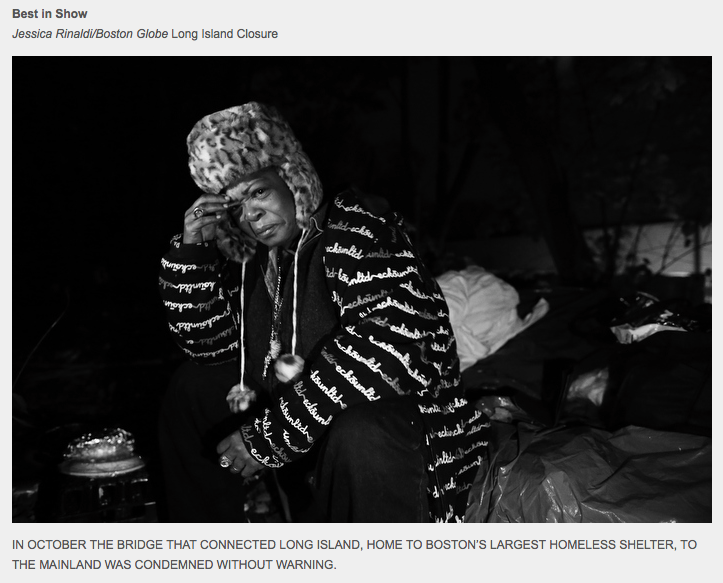 Crosstown at the Boston Globe, the stately local broadsheet garnered eight first place awards by our count, including Best in Show for Jessica Rinaldi. Rinaldi also walked away with Photographer of the Year honors. 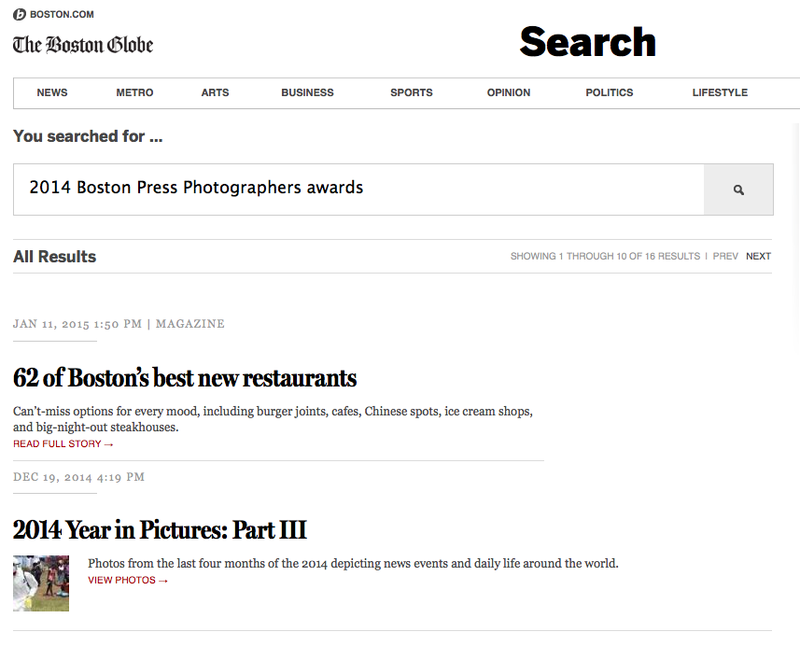 The Globe just hasn’t gotten around to reporting it yet. We’ll check tomorrow’s edition for further details. This entry was posted on Sunday, February 15th, 2015 at 3:42 pm and is filed under Uncategorized. You can follow any responses to this entry through the RSS 2.0 feed. You can leave a response, or trackback from your own site. I will take this as a compliment. Thank you sir. You’re welcome, Mark – that was nice work.